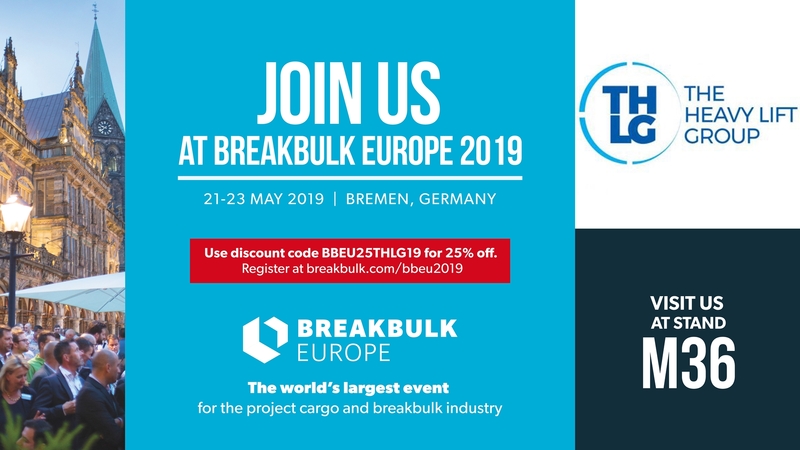 We are so excited that you will be joining us for Breakbulk Europe 2019 in May, either at our joint THLG booth, your own booth or as a visitor! We have attached a personalized email banner and invitation with your unique 25% discount code for this event, we received from the show management. We highly encourage you to use these free marketing materials in emails, social media and on your company website to help spread the word and get people to visit your stand at the show. Use #bbeu2019 when sharing and you will appear on the show management social media wall before and during the event. We expect Breakbulk Europe 2019 will be even bigger than last year. We also want you to be the first to know that BB Show management will be launching new event websites soon. Breakbulk Europe, along with the other Breakbulk events, will have its own website. They have reserved a section for exhibitor news, so please send us your press releases about your company, transports, new products, etc. and we will post on the website and promote throughout our social media channels. New for 2019! You'll be happy to know that there will be free tram transportation to and from Messe Bremen, three conference stages—including an arena for shippers and an innovation stage—plus several new networking areas. More news to follow after our ExCom Meeting this week!